The creation of mobile medical carts, over the course of the last ten years, has helped to revolutionize the healthcare industry. Ever since authorities have begun to mandate that patient information be stored electronically, mobile medical carts have improved workflow and have allowed doctors, nurses, and other healthcare providers to consult digitized records about their patient’s history at the touch of a button at the patient’s bedside. The primary goal of a health facility is to provide quality medical treatment to their patients, and therefore, facilities must organize policies, infrastructure, and staff appropriately to achieve this successfully. Overall, medical carts are a great way to improve workflow and productivity and make it possible to use new medical technologies to their fullest potential, as well as improving the way things are done in a healthcare facility. Ever since the EMR mandate was set into motion, healthcare facilities have integrated a variety of solutions aimed at enabling access to a patient’s health record bedside. Thus, many have turned to using mobile devices such as tablets to access their patient’s information. While tablets and other devices do work quite well, there are some drawbacks. For instance, tablets tend to have inconsistent battery lives depending on usage and other factors. Furthermore, since they do not have a full-sized keyboard, it becomes difficult to record patient notes in any meaningful way. Overall, medical carts allow for prolonged usage and are also faster and more efficient when it comes to recording notes about a patient’s medical history. When medical carts with battery power were first introduced, one of the biggest drawbacks was limited battery life. Mobile workstations required frequent battery recharging. This often happened during interactions with patients, creating an interruption in workflow and increasing the possibility of errors. Today, medical carts are designed to use interchangeable batteries which provide a sensible and reliable solution to the issue of limited battery life. With them, healthcare providers can easily swap out a low battery with a fully charged one without the need to plug their workstation in or turn it off. One of the greatest benefits of using a medical cart is that they are modular. Typically carts can accommodate a variety of different peripheral devices. Different medical practices provide diverse types of care, and as such, some medical carts may require outfitting with diagnostic tools or other types of medical supplies. Regardless, by using medical carts, providers can customize their workstations to suit their workload. 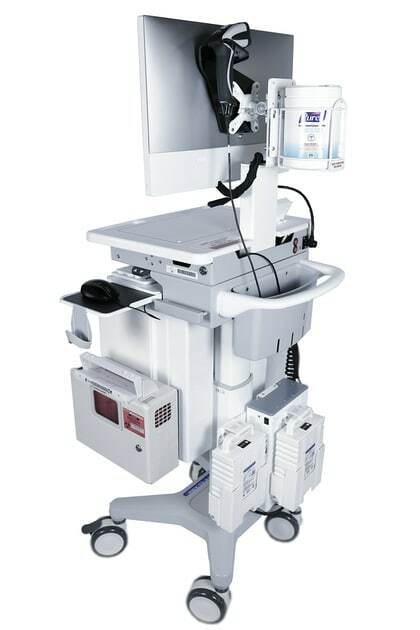 Currently, most medical cart manufacturers design their carts to work in conjunction with different modular components that can be used for a wide range of applications such as bins to help with dispensing medicine, HD cameras that support dual streams for telemedicine and kid-friendly designs that are great for pediatrics. This elevated level of customization allows healthcare providers to streamline their workflow which leads to increased productivity, which helps them provide their patients with proper care. Overall, improving workflow and increasing productivity are challenges faced by many healthcare facilities. However, most view these challenges as an opportunity for growth. The introduction of newer technologies can often upset an established work routine. Nonetheless, improvements to workflow and productivity mean that healthcare providers can offer better and more efficient patient care and better tend to their needs. Furthermore, this leads to less downtime and greater remuneration for any healthcare practice. For those who still have not made the transition to mobile medical carts, it might be time to consider the benefits and solutions they can offer. Medical carts empower healthcare providers to accomplish more during their work day and with this improvement any facility can achieve much more than before.